We’re so glad that wearing your cell phone outside your pockets (like in a huge leather case that dangles askew from your belt) has become taboo. But what about having easy access to your phone? Clipless can make that happen. Created by a company called They Innovate, Clipless is a slick way to attach your phone or other portable device to almost any surface. For example, a disc is placed on the inside of your shirt, and Clipless, the super-strong anodized aluminum centerpiece, adheres to it. 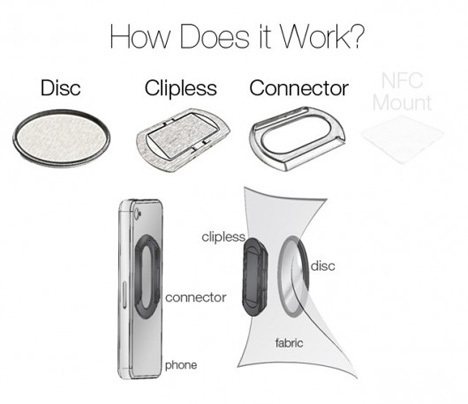 With the mounting bracket attached to the back of your cell phone, it is quickly and easily slipped into place. Clipless has a very cohesive functionality. It’s easily detached from the disc, and the bracket that goes on the back of the device, although held by a sticky surface, can be removed and is easily cleaned. 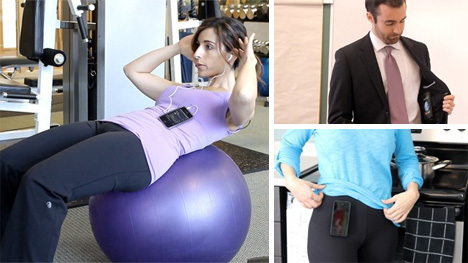 One of the best features is that it’s discreet, so no more getting made fun of for that bulky pouch hanging from your hip. See more in Phones & Mobile or under Gadgets. June, 2013.